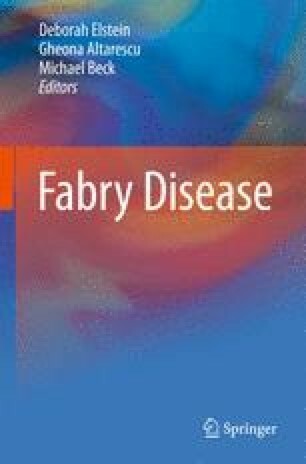 The last decade has seen an enormous expansion of interest in Fabry disease. The spectrum of clinical manifestations has been outlined in studies from single institutions and these observations have been confirmed and extended by publications from the registries which are associated with the two licensed forms of enzyme replacement therapy. It has become clear that Fabry disease, particularly atypical forms associated with residual enzyme activity, is much commoner that previously thought. Estimates range from 1:5,000 to 1:30,000. Fabry disease frequently presents as a stroke or isolated left ventricular hypertrophy. Skin manifestations appear to correlate well with overall disease severity. Some genotype/phenotype correlations have been demonstrated such that patients with miss- sense mutations generally have less severe clinical manifestations at a given age than patients with non-sense mutations. There is a very high prevalence of symptoms and clinical manifestations amongst females with Fabry disease. There is preliminary evidence that enzyme replacement therapy may be altering the natural history of the disease.